The key to cooking fish in a slow cooker without making your house smell like seafood is to wrap the fish in foil. You're essentially baking the fish in the slow cooker, and the foil traps not only the odors but also moisture and seasonings, leaving you with a tender, flaky entree. Fish doesn't take long to cook in the slow cooker, so you can't turn it on and let it bake all day, but you can turn your attention to making side dishes and dessert while the seafood cooks. Cut the fish into pieces about the size of a deck of cards. Cut a piece of aluminum foil large enough to completely wrap around one of the pieces of fish. Lay the foil flat on the counter. Lightly salt and pepper both sides of a piece of fish. Lay it in the middle of the aluminum foil. Top the fish with two slices of lemon. Fold the top and bottom edges of the foil together and crimp them to make a loose foil packet. Gently fold the ends upward and crimp to prevent leaks. Repeat steps 2 through 5 to wrap all of the fish. Stack the foil packets in the slow cooker. Cover the slow cooker and cook the fish on low for 3 hours. Unwrap one of the packets and gently test the fish with a fork. If it is opaque and flakes easily, then the fish is done. If it does not flake easily, cook the packets for another hour. Substitute the lemon slices with lime slices and add a light sprinkling of cilantro to each packet for fish with a Mexican flair. 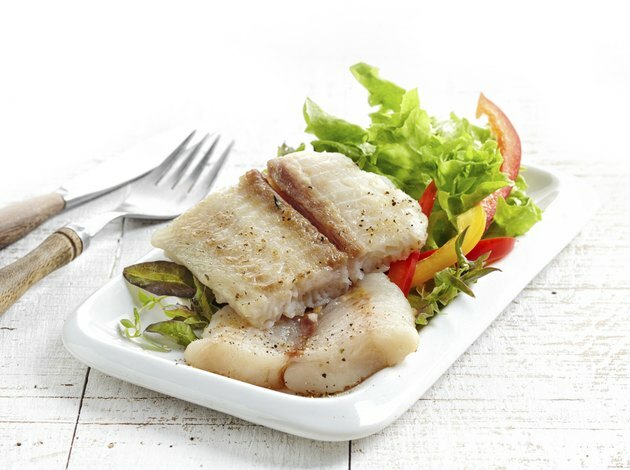 Choose thicker pieces of fish for the best results.